Simply put without Miss Hoey there would be no Glasgow Youth Choir. She founded the choir in 1958 and this is considered one of her greatest achievements. 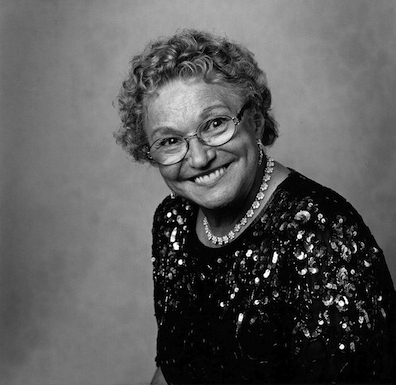 She dedicated much of her life, passion and enthusiasm to growing and nurturing a love of music in generation after generation of children and young people who joined its ranks. Miss Hoey enjoyed a long career in music after studying at the Royal Scottish Academy and then in London. She wanted to sing in Opera but circumstances brought her back to Scotland where she studied at Edinburgh’s Moray House as a teacher. She taught for many years in secondary education as Principal Teacher of music. Throughout her career she was awarded many accolades, including the Loving Cup by the Lord Provost of Glasgow for bringing honour to the city, Scotswoman of the year in 1977 and in 1986 she was honoured in the New Year’s Honours list and was presented with the M.B.E. by H.R.H. Prince Charles, at Buckingham Palace in April 1986. She also received an honorary doctorate from Glasgow Caledonian University in 2002.